The Dec. 3 mass shooting in San Bernardino, Calif., which claimed the lives of 14 county workers and injured 21 others, occurred less than a week after a mass shooting Nov. 27 at the Colorado Springs, Colo., Planned Parenthood facility. There, it was a “lone gunman” (white) who killed three people and wounded nine others. In San Bernardino, however, the official FBI narrative says the alleged shooters expressed sympathy with the group known as the Islamic State group (often called ISIS or I.S.). Why did this deadly attack happen and how can others be prevented? On Dec. 6, President Barack Obama gave a prime-time talk from the Oval Office of the White House in which he deplored the event and laid out measures the U.S. government would take in response. While he didn’t echo the extreme Islamophobia being pushed by his political rivals, and instead cautioned against blaming all Muslim people for the acts of a few, he failed in any way to mention the underlying social and economic crises that could bring about such an attack. What people living in the U.S. and other imperialist countries need to know is that these governments’ military interventions in Southwest Asia and North Africa — where a majority practice some form of Islam — have created a hell on earth for the people living there. The destruction is so horrendous that literally millions have been displaced from their homes and hundreds of thousands of refugees have been risking their lives trying to get away from the fighting. These crisis conditions began as far back as the CIA’s funding and organizing of right-wing Islamic forces against a revolutionary government in Afghanistan in the 1980s. Since then, things have worsened with the “regime change” invasions and devastation of Iraq and Libya. This has created a level of desperation for the respective populations comparable to that in Europe in the era of fascism and two world wars. What are the current wars all about? Obama won’t talk about that, because to do so would expose the fact that U.S. foreign policy is crafted by advisers closely associated with the multinational corporations and banks. How ridiculous and insulting that must sound to peoples whose rich cultural and political histories go back thousands of years! Obama in his talk said the U.S. would intensify its air strikes against the Islamic State group. The U.S. has already conducted roughly 6,700 strikes in Iraq and Syria, dropping more than 20,000 missiles and bombs during a campaign supposedly directed at terrorist groups. Air Force Secretary Deborah Lee said, “We’re in the business of killing terrorists and business is good.” (USA Today, Dec. 4) But the transparency group Airwars estimates those strikes have killed almost 1,000 civilians. The U.S., like the Islamic State group, has been engaged in a war against the secular government of Syria. On the same day that Obama talked about intensifying attacks on I.S., the Syrian government sent an official protest to the United Nations Security Council charging that U.S. warplanes had just bombed a military base in Deir al-Zor province, killing three Syrian soldiers and wounding 13 others. The U.S. has also been supporting Saudi Arabia’s air strikes against an insurgent group in Yemen, the Houthis. In doing so, it is helping the I.S., which is carrying out a ground offensive against the Houthis. One thing is clear: The military actions taken by the Pentagon in the Middle East have not diminished groups like I.S. — they have only elevated them. The rising tensions in this area, which are now spilling over into Europe and the U.S., cannot be separated from the unraveling of the capitalist world economy. While the profits of a tiny group of billionaires soar into the stratosphere, the signs of crisis keep multiplying. A key sign of capitalist crisis is overproduction: a glut on the market caused by producing more goods than people can afford to buy. As far back as April 24 the Wall Street Journal wrote, “The global economy is awash as never before in commodities like oil, cotton and iron ore, but also with capital and labor.” The situation has only deteriorated since then. Even more recently, petroleum prices fell from $100 a barrel in 2014 to $37 a barrel on Dec. 7. The political fallout from this can be seen in all the oil-producing countries, from the U.S. itself to Russia, Venezuela and of course the area now engulfed in war. This reflects the completely chaotic character of the capitalist mode of production. The boom-bust cycle has been made even more intractable with the high-tech revolution. 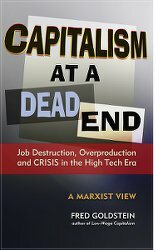 Initially, the bosses vastly increase their profits by introducing labor-saving technology, but the rise in productivity while jobs are being cut eventually leads to a big crash and intense suffering for the masses of people. Demagogic politicians who know that even tougher times are coming are trying to focus mass anger anywhere except on the capitalist rulers who have brought the world to this disastrous situation. That was the role of Hitler and Mussolini in the 1920s and 1930s, of Le Pen in France today, and of Donald Trump and his virulent Muslim-bashing in the U.S. If we are to defend the lives of innocent people not only from random killers but from the ravages of more wars and depressions, we must fight for the unity of all workers and oppressed peoples against the racist warmongers.